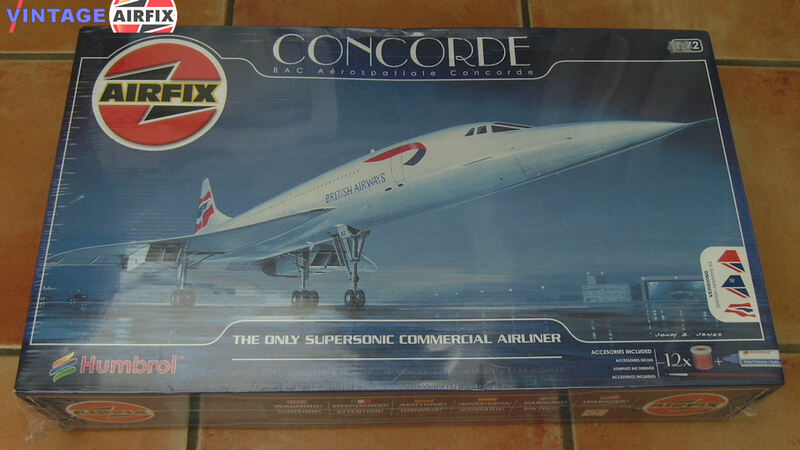 Airfix's new Concorde kit provides a great addition to the small but significant line of 1/72 scale airliner kits. It's molded in white, clear, silver, and dark metallic-gray styrene, and has vinyl tires. The 36-page, 36-step instructions have large illustrations, but the use of similar number codes for parts, paints, and decals is confusing. Airfix doesn't provide a key for the different number flags in each step, so allow me: white number in black box is the part number; black number in white box is the decal number; black number with no box is the color number, which is cross-referenced to the chart on page eight. There! A large six-piece stand is an option, and the kit can be built with landing gear up or down. Provision is made for the Concorde's droop-nose feature. Panel detail is recessed, but soft. The plastic, too, is soft and a bit rubbery. Along with the soft detail comes sharp edges to the parts, resulting in seams on most components that need to be filled. Take care assembling the engine pods as all the parts are handed. The integrity of the mechanism that allows the nose to droop is compromised by a complex design and the combination of soft white and brittle clear styrene. It worked once for me before something gave way. I ended up gluing the nose in the raised position. The cockpit interior is detailed with seats, decaled instrument panels, and the unusual control yokes, but little can be seen through the windows. The plastic main landing-gear struts are fortified with metal rods. The main wheel well doesn't fit tightly to the wing bottom, but the main doors hide most of the mismatch. The fuselage is molded in three two part sections, forward, center, and rear, and capped by separate nose and tail cones. Check your sprues when you get your kit. The seams where the fuselage sections meet were prominent. The fin's leading- edge fairing is thicker than the small fairing on the central fuselage, so I built up the difference with epoxy putty. My sample had sink marks on the long dorsal- canoe fairing, and lots of ejector-pin marks marred the bottom surfaces of the elevons. The landing gear fit perfectly and is strong enough to hold the big model. I use a big spray can of gloss white Krylon for the overall scheme. I left the landing gear and rear engine pods unpainted as the color of the plastic was sufficient. I framed the cockpit windows with white decal stripes. Certainly the highlight of the kit is the huge decal sheet with a full complement of stencils (most go on the bottom surface) and all three permutations of British Air markings from 1976 until retirement in 2003. The printing is well done, although the toned "furls" in the last fin-flag design are missing. Applying the decals was tricky, as they were very thin and didn't want to move once they landed on the model. I recommend using water, a bit of saliva, and a soft brush to maneuver the decals. Use decal setting solution only after each marking is properly positioned. The flag designs for the fin were a bit undersize, not quite reaching the leading-edge panel lines as shown in the instructions. Also, the cabin door outline decals weren't the same shape as the engraved doors on the fuselage. The finished model is eye-catching, mostly because of the subject. Serious modelers will want to take more time than the 45 hours I put into mine to improve the fit, clean up mold marks, and perhaps try to make the hinged nose work better.